In accordance with UNCLOS provisions, a coastal state may extend the outer limits of the continental shelf beyond 200 nautical miles from the baselines. It is required for a coastal state to submit relevant scientific data and information to the Commission on the Limits of the Continental Shelf. Japan was the 13th country to submit such data and information to the Commission in November 2008. The Commission began its examination at the meeting in August 2009. In looking at the Commission's examinations of other coastal states' submissions however, it appears that the principles for the examinations are less than clear and that varying examinations are made on a case-by-case basis. The gathering and analysis of various matters related to the extension of the continental shelf are therefore important, including analysis of the recommendation made by the Commission, information on any exchanges between the Commission and delegations of coastal states on their submissions, and analysis of general ideas in the examination by the Commission on relevant issues. OPRF is supporting Japan's submission by conducting research on progress in examinations of submissions made by other coastal states, and recommendations adopted by the Commission, as well as posting information it has obtained about the continental shelf on our website. Click here for more information (in Japanese). In recent years, along with progress in the world economy and its globalization, there has been an increase in maritime transport and this, unfortunately, has led to piracy incidents that frequently jeopardize the safe navigation of ships. Thus, seeking to ensure the security of international straits has become an urgent challenge. Therefore, for the safety of ships navigating the Straits of Malacca and Singapore, which are vital sea transport routes for East Asian countries including Japan, China and the Republic of Korea, research has been carried out on formulating an international framework for cooperation between coastal and user states. Research and study on the Marine Electronic Highway (MEH) under development by the International Maritime Organization (IMO) has also been conducted. 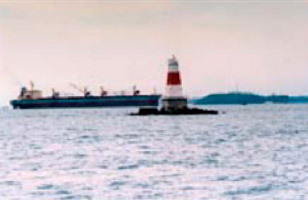 In September 2007, a Cooperative Mechanism for Safety of Navigation in the Straits of Malacca and Singapore, which OPRF participated in, was agreed upon and in April 2008 an Aid to Navigation Fund was also established. Through the initiatives of The Nippon Foundation, these will provide financial support based on the concept of corporate social responsibility (CSR) from user states and the maritime industry. The fund will provide maintenance and upgrade of aids to navigation in the Straits and is the world's first realization of cooperation between user states and user industries based on the UN Convention on the Law of the Sea.